Before we even made it to Austin, we played a couple of great gigs in San Antonio and Corpus Christi with our favorite songwriter from the UK, Frank Turner. 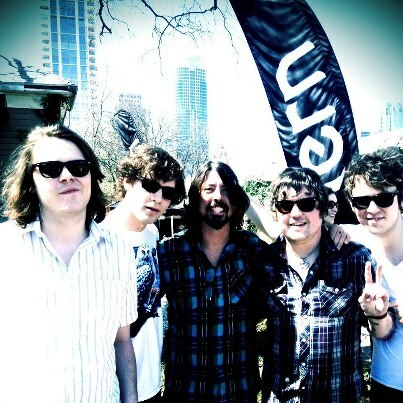 En route to check-in at SXSW we met Dave Grohl! He was walking with producer Nick Raskulinecz, an old buddy of our drummer Jon (he produced Jon and our manager Ben’s old band The Benjamins back in the year 2000). Dave did a funny impression of Rami, who plays in the Foo Fighters in addition to the Wallflowers. Dave Grohl was a rad enough dude to oblige a picture! Our first showcase was at the Ginger Man pub for BLURT! magazine. We met a Shades superfan from Belgium named Huddie. With all the bands out there, it’s humbling to meet folks from across the pond who listen to us. Our last show was at a new BBQ joint, Freedman’s Bar, owned in part by our buddy Jimmy Ace, who is the soundman for The Wallflowers. It was the eatery’s first venture into live music – they literally built the stage out of benches and plywood an hour before showtime. Jakob, Rami and Bob Dylan’s guitarist Charlie Sexton showed up right before our last song. The ‘Flowers were opening for Eric Clapton down the street that night. They all came up and sat in on “The Weight” and “One Headlight,” we learned the latter the day before leaving Milwaukee. 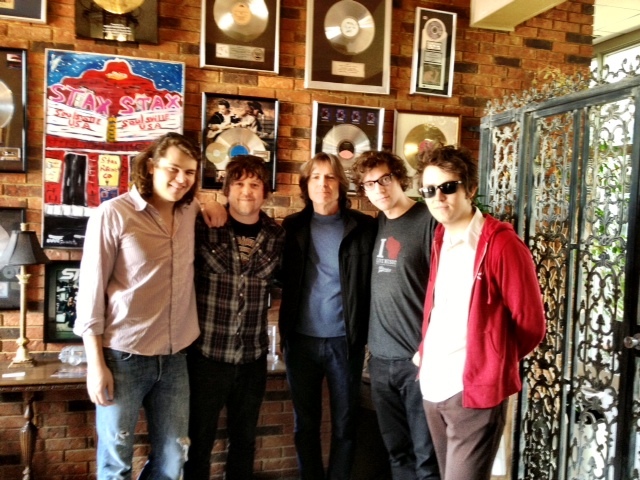 The feather in our cap was stopping at Ardent Studios in Memphis and getting a 90-minute personal tour by Big Star’s Jody Stephens. We’re huge Big Star fans, and the history and vibe of the place left us all inspired. Jody is a golden soul, a very gracious gentleman., and we may have found the canvas for our next record. Well, that’s it for now. It was a star-studded tour to Austin, and we made plenty of new friends. Thanks for the support, everybody! Stay tuned–we’ll try and stay current with what’s going on in our camp, including a new MUSIC VIDEO(!) and tour dates for the Spring.